P-39Q Airacobra N6968 "Miss Connie," operated by the Commemorative Air Force. History: The P-39 single-seat fighter was, in all respects, a radical design for its day, and proved the adage, "Form follows function." It was designed around a 37mm T-9 cannon which, in order to maximize the airplane's forward firepower, was fitted to fire through the propeller hub. In order for the cannon to fit inside the nose, the engine was placed behind the cockpit, and drove the propeller via a long shaft which passed under the pilot's feet. The center-of-gravity shift caused by the engine's location resulted in the need for a tricycle landing gear arrangement, the first of it's kind among WWII fighters. The prototype XP-39 first flew on 6 April 1938, and after several evaluation programs, some major modifications were made to the design, resulting in the first production version, the P-39C. This production version entered service with the US Army Air Corps in 1939, but was almost immediately upgraded to the P-39D model with self-sealing fuel tanks, more guns, and larger fuel capacity. In July 1941, the Royal Air Force took delivery of the first of 675 P-39Ds (called the Model 14 by the RAF) which they had ordered the year before. Shortly after delivery, however, the RAF realized that the aircraft had minimal performance characteristics without a turbocharger, an accessory that had been deleted early in the aircraft's development. It was too late to cancel the order, and only one RAF squadron (No. 601) ever flew it operationally. Over 250 of the others were sent to Russia, about 200 more were transferred to the US Army Air Force in Britain, and another 200 or so were sent back to America and designated as P-400s. At least eight additional variants were later built. Most changes to the original design involved new engines and propellers, but otherwise the airframe remained very much the same over its production life. The P-39N and P-39Q were built for the Russian air force under the Lend-Lease military assistance program, and 4,773 Airacobras were delivered to Russia by American and Russian ferry pilots. 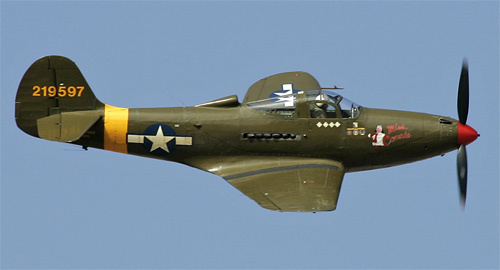 Seven P-39s were designated as the F2L and used as US Navy target drones. The Airacobra served successfully in the ground-attack role in North Africa, and in the Pacific theater, until more powerful fighters began replacing it in 1944. Other nations which acquired P-39s included Portugal, France, and Italy. The Airacobra, though hampered by its lack of a turbocharger, was a very satisfactory low-altitude attack airplane, and served as faithfully as any other combat aircraft. Nicknames: Caribou (RAF), Britchik (i.e. "Little Shaver") (Russian nickname). "Shaving" was slang for "low-level strafing." Weight: Empty 5,610 lbs., Max Takeoff 8,400 lbs. Wing Span: 34ft. 0 in. All text and photos Copyright 2016 The Doublestar Group, unless otherwise noted. You may use this page for your own, non-commercial reference purposes only.